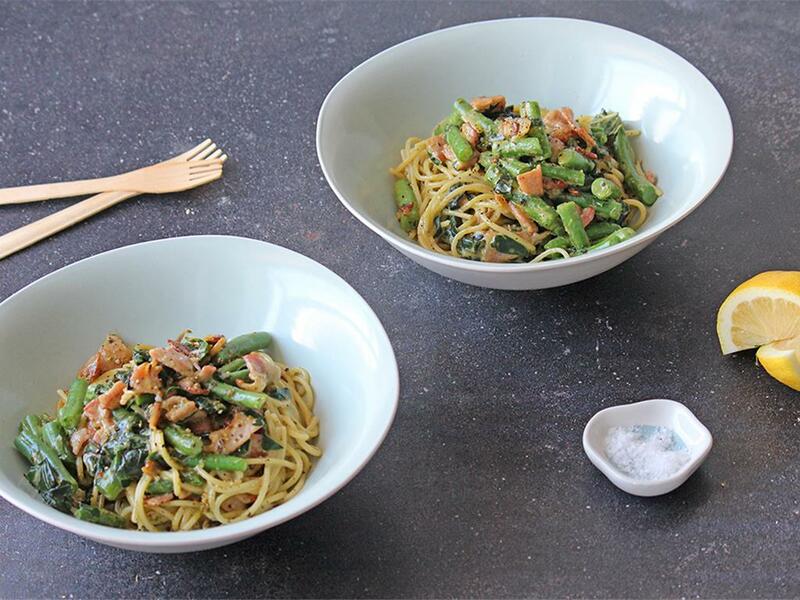 Crispy golden bacon and crunchy green beans in a basil pesto sauce, served mixed through spaghetti. Spaghetti: Place a pot on medium-high heat and add the boiling water. When the water is at a rolling boil, add the spaghetti and cook for 5 minutes. You want it al dente, which is slightly chewy and translucent. Drain, reserving some of the pasta water (a little more than 120ml for 4; 60ml for 2) and drizzle with a little olive oil to keep it from sticking together. Saucy bacon & greens: Place a pan on medium-high heat with a drizzle of olive oil, add the bacon bits and fry for 5 minutes until golden. Add the green beans and sauté for 2 minutes before adding the pesto and reserved pasta water (120ml for 4; 60ml for 2). Mix well, then pour in the cream and cook for another 3 minutes until the green beans are almost cooked. Add the Swiss chard and wilt for 1 minute, then add the spaghetti and mix through. You can add more of the pasta water if necessary.